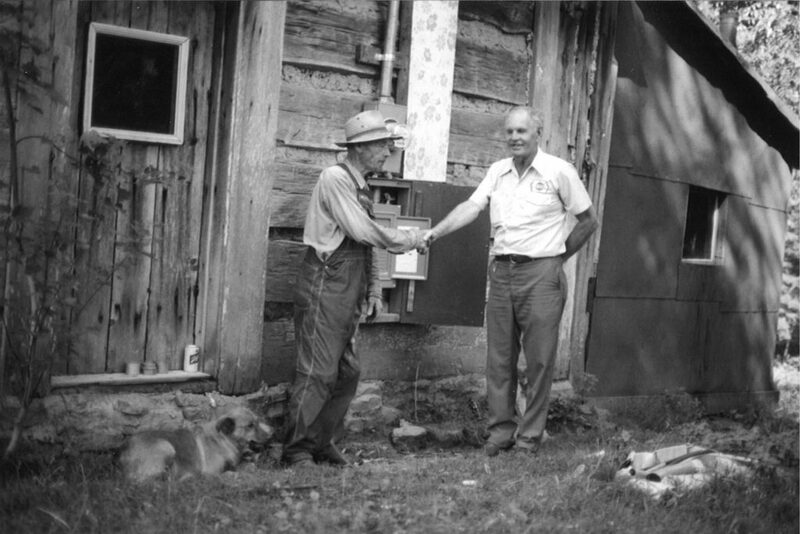 In the early 1930s, only four out of every one hundred farms in Tennessee were served with any form of electricity. Except for a few privately owned Delco battery power systems, the citizens of Meigs County lived and worked under primitive conditions when compared to their counterparts in the larger towns and cities. Finally, a group of interested Meigs Countians approached the Tennessee Electric Power Company requesting that a power line be run from Athens to Decatur. The power company agreed to do so for the sum of $23,000. From Decatur, the county could extend its own lines, with the consumers bearing the full costs. Of course, this was an impossible financial undertaking for the citizens. In 1933, Willis A. Shadow, University of Tennessee Agriculture Extension Agent for Meigs County, saw new hope for the residents along the Tennessee River with enactment by Congress of the Tennessee Valley Authority (TVA) Act. Mr. Shadow began talking “electricity” throughout the county. County Attorney J. W. Lillard joined the ranks, agreeing to furnish Mr. Shadow with legal advice without fee. Enthusiasm gained momentum until a mass meeting of 500 citizens at the Meigs County Courthouse resulted in the May 29, 1935 formation of the Meigs County Power Association, Incorporated, which later became the Meigs County Electric Membership Corporation. 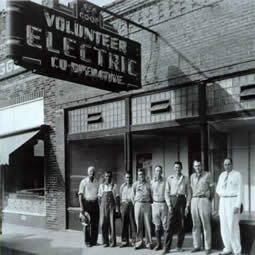 The name was changed in 1939 to Volunteer Electric Cooperative and in 2001 to Volunteer Energy Cooperative. During 1935, President Franklin D. Roosevelt established by executive order the Rural Electrification Administration for the purpose of lending money to cooperatives, commercial power companies and other groups to build rural power lines. In 1936, Congress passed the Rural Electrification Act which established the REA as a full scale agency of the government. 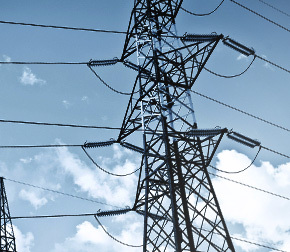 When the commercial power companies did not take advantage of the REA loans to build lines, REA turned to assist local electric cooperatives to come into being. VEC was the first electric cooperative in the nation to take advantage of the funding offered through the REA. The first lines erected in Meigs County were energized August 6, 1936. For the first month of operation, 5,019 kilowatt-hours of electricity was distributed with a total income of $183.16. In 1939, just seven years after the Tennessee Electric Power Company refused to provide electric service to Meigs County, the rural cooperative entered into a contract with TVA to purchase the power company’s distribution properties in McMinn, Bradley, Meigs, Polk, Roane, Rhea, Cumberland, Putnam and Fentress Counties for $276,700. Recognizing it would soon be serving an area far larger than Meigs County, the corporation changed its name to Volunteer Electric Cooperative. As the mission of the cooperative expanded, subsidiary companies were formed to serve the needs of rural residents for metered propane and natural gas service. Reflecting its expanding role, the name of the organization became Volunteer Energy Cooperative on June 1, 2001. Since these early beginnings, the story of Volunteer Energy Cooperative can be summed up in two words – growth and progress. By June 1940, the Cooperative was serving 3,631 members. In the span of five years, from 1940 to 1945, VEC almost doubled in size, listing a membership of 6,488. 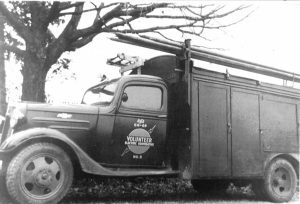 VEC experienced the largest growth during the late 1940s and early 1950s when the Rural Electrification Administration pushed cooperatives to build lines to as many customers as possible under the “Area Coverage” program. During the first 40 years of VEC existence, electric rates remained stable with only minor changes. The electric bill actually shrank as a portion of the family budget during this time. But, beginning with the Energy Crisis of the mid-1970s, rising energy prices more than doubled the wholesale cost of electricity and TVA rate increases began to occur more frequently as the cost of coal and other fuels increased. However, the Cooperative’s customers continue to enjoy rates that are among the lowest in the U. S.
Today, Volunteer Energy Cooperative is one of the largest rural electric cooperatives in the nation, serving more than 115,900 members in all or part of 17 Tennessee counties with more than 10,000 miles of power lines strung from Georgia to Kentucky borders. With its corporate office in Decatur, Tennessee, VEC serves its members through nine customer service centers in Benton, Cleveland, Georgetown, Decatur, Spring City, Crossville, Monterey, Jamestown, and Byrdstown. The nine offices are administered through the Cleveland, Decatur, Crossville, and Jamestown service areas. The affairs of Volunteer Energy Cooperative are governed by a Board of Directors consisting of 12 members representing the 17 counties served. The Board of Directors is responsible to the members for the policy-making function of the Cooperative. It delegates authority to the President/CEO, who is responsible for the overall operation of the organization. The cooperative has six staff departments which are Executive, Accounting and Finance, Operations, System Planning and Engineering, Marketing and Economic Development, and Information Technology. The vice presidents of these departments form the Management Council which reviews the cooperative’s day-to-day operations. The cooperative purchases electric power from the Tennessee Valley Authority at wholesale rates and distributes the electricity to consumers. Volunteer Energy is a non-profit organization and is pledged to bring electricity to the member-consumers at the lowest possible rate. Out of every dollar that VEC collects, more than 80 cents goes directly to TVA to purchase power. In 1994, the Rural Electrification Administration, under government reorganization, became the Rural Utilities Service with additional responsibilities to provide more utility services to rural customers, including water, sewer, telecommunications, and natural gas. VEC continues to develop strategies to maintain strength in the years ahead. New substations have recently been completed in Bradley, Hamilton, Cumberland, and Polk counties. An aggressive in-house economic development plan not only assists in attracting new organizations to VEC’s service area but also ensures that existing businesses remain productive and profitable. The formation of the organization in 1935 brought affordable electricity to those who would have been otherwise unserved. Today, VEC continues to provide needed services with subsidiary ventures into metered propane (Volunteer Energy Propane) and natural gas (Volunteer Energy Natural Gas) which hold to the Cooperative’s core value system of affordable service and reliability. Increasing use of technology will allow VEC to remain competitive in the years ahead. Real-time communications with substations via the SCADA system allows remote monitoring and troubleshooting. Automated meter reading is being implemented throughout VEC’s service area. Internal computer upgrades will guarantee continual customer service improvement and paved the way for additional features such as electronic bill presentation and payment. In 2001, VEC launched VECustomers Share, a program that awards grants to community organizations in its service area. The impact has been huge, with more than $4.7 million already awarded. Funds come from VEC customers who agree to have their bills rounded up to the nearest dollar to help their neighbors. In its more than 80 years of operation, Volunteer Energy Cooperative has grown and prospered, bringing prosperity to the region it serves. Change is inevitable; however, VEC has not lost sight of the reason for its existence – the members it serves.